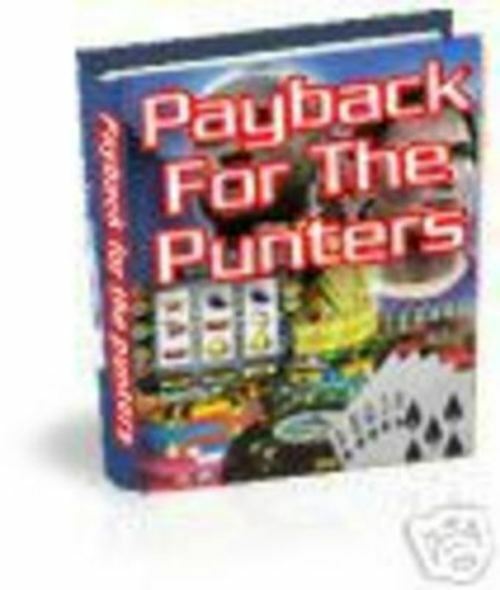 If you gamble and want to stack the odds in your favour then Payback for the Punters is an ideal ebook for you. Included inside are systems to maximise your football and blackjack winnings. Plus you also get links to casinos that are offering $100s in free bets, so you don't even have to risk your own money to test the systems. For such a low price this is an offer that any online gambler would be stupid to pass up. 1) Take advantage of the current Football season and Win:- Football is much more likely to go true to form than horse races. Consequently the bookies have always been very cautious when it comes to football betting. Using Payback for the Punters you can take advantage and win. 2) Win from the bookies without using your own Cash:- Included inside Payback for the Punters are links to casinos where you can get free bets. Some of these free bets are worth $200 so this alone is worth much more than the price of purchase. 3) Take Advantage of the Blackjack tables for the best odds outcome using the FREE Blackjack Calculator:- Also included with Payback for the Punters is a free odds calculator for Blackjack. This can be used in combination with the Blackjack system to tilt the odds in your favour. Payback for the Punters black jack betting system calculator;blackjack betting system;payback for the punters;punters 161519218 3.50 keystone Fresh Download Available!